Hunting Monsters: Third Time Lucky? When the Al-Aqsa Intifada began in 2000, it was noticeable that the Israeli military responded quickly to Palestinian rioters with lethal force. The intention may have been to quickly quell the uprising, so as to prevent the long-running series of rolling riots and demonstrations that characterised the Intifada that began in the late 1980s. The Israeli military’s swift use of live bullets did indeed drive demonstrators and stone throwers off the streets, but their place was increasingly taken by gunmen and suicide bombers; in effect, the Israelis succeeded in militarising the Intifada. This is not to say that gunmen and suicide bombers did not exist already, but the driving of stone-throwers and demonstrators off the streets meant that the Intifada became one of guns and bombs (and later rockets); the Palestinian masses largely became spectators. At the moment, tension in the West Bank and Palestinian areas of Jerusalem is riding high. There have been a series of demonstrations and riots that have seen stones thrown at Israeli troops. And we have also seen Palestinian youths killed by Israeli soldiers. Two youths were shot dead in a village near Nablus on the 20th March. On the following day, in the same village, two other youths were killed in the outskirts of Jerusalem, ostensibly while attempting to stab an Israeli soldier. The first of these two incidents is attracting some attention. Israeli military sources reported that the two teenagers were not hit by live rounds but instead were accidentally killed by rubber bullets. 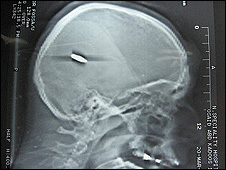 Doctors who treated the two are disputing this; an X-ray showing a bullet in the middle of one youth’s head does rather challenge the veracity of the Israeli army’s statement. This would not of course be the first time that the Israeli military have lied about the circumstances in which they killed Palestinians; it is not surprising that the circumstances in which the other two fellows were killed are also being challenged. It will be interesting to see how things on the West Bank develop, and whether this is the beginning of a Third Intifada. If it is, its relationship to the main Palestinian political movements will be interesting. Fatah has largely given up on confronting Israel, and is instead pursuing an ineffectual strategy of negotiations with the occupying power. Hamas is ostensibly in favour of street politics, but its own fondness for military action makes its relationship with demonstrators and stone throwers problematic; the organisation required for launching rockets and despatching suicide bombers is intrinsically vanguardist and sits uneasily with mass action. So perhaps a Third Intifada will see mass action operating outside the control of the two dominant parties. Or maybe a resolute response by the Israeli military will drive the demonstrators off the streets and ensure a re-run of the Al-Aqsa Intifada.